I have been thinking about color, probably because the QuiltArt list has been talking about color. That discussion started when someone said they were having a hard time working with “bright” colors. Lots of advice has followed which has included, “don’t use bright colors if you don’t feel comfortable with them” to “here are some exercises to use to help in your desire to brighten your palette.” I have offered no advice, but have been thinking about what my advice would be. I tend to believe that the color palette we use evolves and in time becomes our own, regardless of efforts to adopt a particular way of working with color. I found it particularly interesting that this person was striving for an ability to use brights. I think that most beginning artists, and maybe I am thinking more about painting, tend to start with a bright palette and work toward a more modulated, sophisticated, if you will, palette. On the other hand, perhaps this person comes from a traditional quilting background and was originally drawn to antique quilts and the modern fabrics that mimic the old, faded, earthy colors of the antique quilts, and that is where she is coming from. One of the other threads that came out of the original question is the uses of the color wheel, especially using complementary colors to “brighten” each other. (I’m not going to go into the fallacies of that concept, just throwing it out as what’s been discussed). 1. Do you find that you use a consistent color palette in your work? 2. If you answered yes to #1, did you consciously choose that palette or did it evolve in an unconscious way? 3. Do you use a color wheel? (I’m talking about an actual chart or revolving wheel thingie) and if so, how do you use it—ie what answers does it provide for which questions? 4. Do you use an internalized knowledge of the color wheel and color relationships to help you make color decisions, and how does that internal dialogue go? 5. Do you choose color in a purely visceral, instinctive way? I think I use a combination of 4 and 5, leaning most heavily toward 5, but having studied color it is probably in the back of my mind. I also know that when I can observe that a particular color is not working I tend to fall back to the known relationships to find a way to fix what is wrong. I also feel that a background in painting and mixing paint, in particular, is one of the most valuable tools I have when it comes to working with color in fabric work. The photos are just for fun. The first is, of course, Mondrian, whose color palette is very distinctive and instantly recognizable to most people. The second is the same piece recolored. I think the new palette is a nice combination of colors but would never be recognized as the work of Mondrian. Color is very personal. 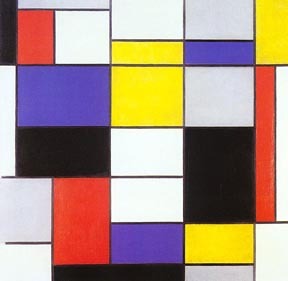 I think Mondrian’s work relies so heavily on his colour schemes. The balance of black and white is perfectly secure and controlling, and the cyclical equilibrium of the primary colours is similarly rooted in simple, but fundamental reactions to colour. There’s an instinctive human connection with the colours used and also an artistic core as from black, white, red, blue and yellow spring all the colours of the artist’s pallete. Mondrian’s schemes were perfect reflection of the structural elements of the interesecting lines. In my eyes his De Stijl works are powerful comments on the balance of positive and negative in all art. I have been following this discussion when I could over the last few days and am fascinated with all the thoughts about color. I also find I am in agreement with so much of what you all are saying. Eileen’s comment that she was told “don’t use colors that look like they came straight out of the tube of paint” rang true as I remember that same dictum from university painting class. I bought that premise wholly and have followed that advice for 40 years–not because it was a “rule” but because colors out of the tube are lacking in nuance and most of all, intention. I want more control over my choices than that. I am also aligned with June, favoring the outside edges of the primaries and secondaries over the dead center. I always talk about “off green” or “off blue”. I like June’s “Toad (toward) yellow”! And while I am well-educated in color theory, when I am making choices it is always “I’ll know it when I see it”. Many thanks to all for picking up the topic and running with it. Since June has already broken the rules concerning discussion of grandchildren, I don’t want to further risk the wrath of Maggie, so I will simply point you toward my blog for photos of the the most beautiful baby in the world. http://www.andsewitgoes.blogspot.com And add my thanks for your private good wishes, that were forwarded by June. News Flash: Terry now has a granddaughter, Sofia Graciela Molina. Emily had a long labor so everyone — baby, Mom, Pop, Terry and Ray — are now resting. And yes, I violated all Maggie’s Ragged Cloth Rules — but then, new births among our contributors override the rules every time. I loved what you did to the Mondrian, Terry. We could have a Renaissance one, a Japanese one, Caribbean, Pompeii, etc. Every time and place seems to have a palatte. My personal palette is jewel toned. Blacks and greys (blueish, not brownish! ), and a little pure white, blue reds, blues, purples, periwinkle, and pink, and lots of dark greens as background. I love having lots and lots of shades, tints and values of each color. When I began to think of myself as an artist, rather than a quilter, I purposely stopped using “my” colors and for almost 3 years worked exclusively in colorways I didn’t instinctively love or understand or feel confident about until I felt that I could use any color. It was very very hard, but very satisfying. I, too look for color combinations in nature, architecture, fashion and art and think about how they could be used in something I’m working on. I don’t use a color wheel (real or virtual) because I have to see the combination “in real life.” I put lots and lots of fabrics together until I see the right choice. My use of colour is totally instinctive and although I know about the colour wheel from the printing aspects of my publishing days I never consciously use one in my textile work or when I am using pastels. My colour use reflects mood and emotion and my decisions are driven by my subject matter rather than an abstract decision about the look of a piece. On the other hand, seeing a ‘colourway’ (i.e. a combination of colours) in the earth, or a wall, or somesuch, can spark an emotion or memory which leads to a specific work. that are aimed at a more casual audience and with lower prices. If I want to have something in here, I want it to sell and that means using a more commercially acceptable pallette–brighter colours. Am I “selling out”? I don’t think so. I need to be able to buy the supplies for the good stuff, even if that means mass producing quick sale items. But I’m strssing over doing it. Not to worry, I’ll survive, but I wonder if others have been able to change their pallette in erspnse to an external stimulus. I’ve discovered in my art travels that textile artists are often really sophisticated about color — far more so than painters who are early in their careers, for example. I can tune out the color lectures in my painting classes — I’ve known all that stuff about making mud and split primaries for years, mostly from dyeing but also from designing on the design wall. I even know the varieties of brown that one achieves when the various complements run into one another (as in low water dyeing). It surprised me that in this regard I was way ahead of the others who were painters. I always think in split primaries — that is, the alarzarin red that leans toward blue and the cadmium red that leans toward yellow; the cadmium or yellow-gold that leans toward red and a lemon yellow that leans toward blue and then the ultramarine purple that is a blue leaning toward red and cerulean (or greenish blue) that leans toward yellow. The split primary system really make sense when you are mixing colors, whether in dyeing or in paintings. You can avoid or make stunning muds and have a sense of control that is very nice. One of my instructors told an anecdote about not understanding his teacher who talked about “toad” yellow and “toad” blue — meaning “toward.” That has stuck with me. Someone mentioned the difference between visual mixing and physical mixing of colors, and said that they require different color combinations to achieve similar results. I am curious about this — I’ve read a little on Hilary Page’s watercolor site http://www.hilarypage.com/VisualComplements.html , but I am still confused. Can anyone cast further light on the subject? By the way, I’m pretty inconsistent in my color choices, and I generally move instinctively, although I often check my internalized color wheel when I get stuck or know that I need a specific effect but can’t achieve it automatically. It’s really interesting, Pat, that you started with traditional colors. Lighter shades are easy to achieve with dyeing (ask me how I know!) but I find them more difficult to find except in the kind of baby colors in commercial fabrics. By the way, Terry is waiting for a grandchild to be born (the child is making motions but seems to be having doubts), so we’ll have to take over while she’s tending to the mom-to-be. I’m sure we can manage…. Looking at the Mondrian, I had to look up my art history notes… The style is literally “The Style” or “De Stijl” (pronounced ‘shtail’, rhymes with ‘pail’). His compositions used only vertical and horizontal lines; only the primaries and white, black or grey. The composition is non-objective. Mondrian played with the nature of color; for example does the red advance, what effect does the area have on the color. the wikipedia entry at http://en.wikipedia.org/wiki/De_Stijl has examples of a chair and the Schroder House (very cool!) which conform to the ‘rules’ of De Stijl. as for myself and color – for most of my pieces i can’t say i really plan out a color scheme. usually i am more concerned with the ‘moods’ of the colors, are they evocative of a certain season or time of day (or night), does the sky fabric make sense with the water fabric, if it is an overcast sky in the scene are the other colors also subdued. however for large commissions i definitely do plan it out, and usually with the help of a color wheel divided down to the tertiaries. i have a general idea of at least one color i want to start with, and then look at different combinations, such as using an equilateral triangle, isosceles triangle or rectangle in the center to ‘point’ at the combinations. i challenge myself to use ‘muddier’ and thus more complex colors. Some good advice i was once given – don’t use colors that look like they came straight out of the tube of paint. I think most people would recognize my work by its use of bright hues — and I find myself often drawn to “challenging” color schemes — complementary, split complementary. I think its fairly conscious, as I find monochromatic and analogous color schemes too easy and it often bores me to work within that kind of scheme — though I like a lot of work that is more neutral and subtle, it just isn’t me. I think part of it is my love of folk art and folk craft. Sometimes I consult an online color wheel or site that shows one interesting color schemes, but I know that I carry an internal wheel in my head. I am pretty darn close with my choices. Not to say that some people (and some show jurors) think my color sense is way to “chromatic”. 4. Do you use an internalized knowledge of the color wheel and color relationships to help you make color decisions, and how does that internal dialogue go? SEE ABOVE. The dialogue happens on my design table (not board). I pile up stuff, audition fabrics, keep playing with layers and often change it all at the last minute, often towards something riskier! Yes, I literally hear colors talking to each other. I think its a mild form of synathesia. Yes, but informed by that internal color wheel. instinct” is informed by all I have recently learned about choosing a palette for a specific fabric design, and I am less hesitant to try something different. I feel I must reply as I believe it was my original query that lead to the discussion on the QA list. Colour is the first consideration in any work I do. I usually use my internal understanding fo the colour wheel to guide my colour choices, but once in awhile consult an actual wheel. My choices tend to be shades of a hue rather than the pure hue. My background is more in stitchery than quilting, but yes, most of my early influences were traditional. I took my first colour course in the very early 80’s from Wilke Smith. I have often said that her inspiration has had more effect on my work than any other course or technique I’ve ever been exposed to-and there have been many. I’ve had positive feedback for my use of colour in any work I’ve had judged. Now I want to stretch myself by introducing lighter shades of colour into my work.